My brother sets up game cameras in different areas. Over a year ago, he set it up in my yard. 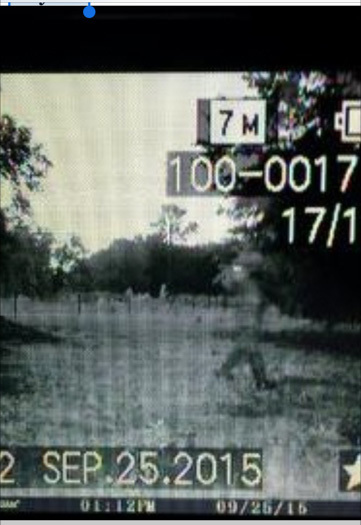 When he checked it there was a unexplained figure in the photo. Almost a year later, he had his camera set up on a tree in the cow pastor. 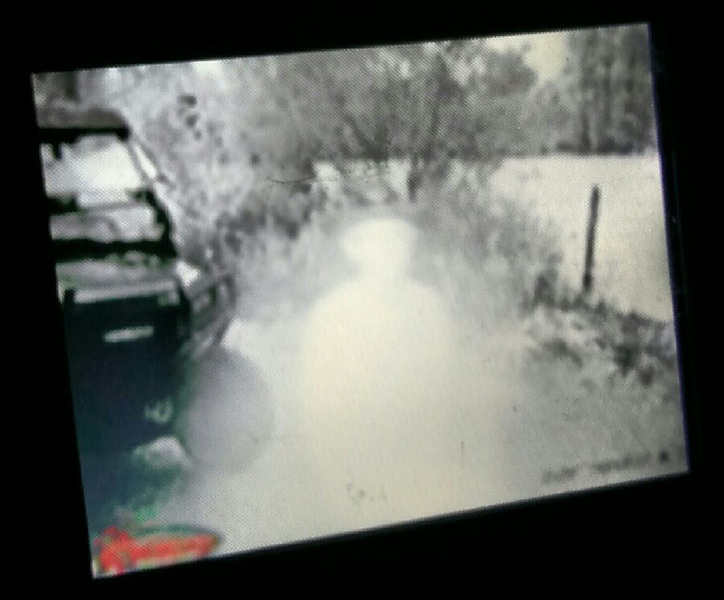 When he check it, you can plainly see a ghost and also see his buggy as he had just pulled up to the camera. During the Civil War, there were a couple Union and Confederate war boats sunk in this lake. The lake was called Dunn's Lake up until about 1940, then it was names Dead Lake. It is a part of Crescent Lake. In the early 1900, there was a train that went through this property going to and from the lake. The lake was used as transportation for people and goods. There was a lot of timber farms and turpentine camps in the area along with regular farms. The area had quite a few homes and stores. It was a very popular area. There was an hotel down by the lake that was a tourist hotspot. Numerous boat tours were done daily, along with picnics on shore for the visitors. After talking with an gentlemen who's ancestors were here in the area in the early 1900's, he said there was a colored church and cemetery in the woods not far from where these pictures where captured. I have done a lot of research on this area, and I know there were a lot of homes, white and color people in this area. I have also found where most of the homes sat. Can anyone explain or tell me what they see in these photos? The location is in St. John's Park, Bunnell, Flagler County, Florida. The following comments are submitted by users of this site and are not official positions by yourghoststories.com. Please read our guidelines and the previous posts before posting. 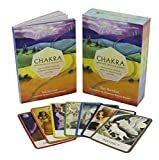 The author, ggrdn1250, has the following expectation about your feedback: I will participate in the discussion and I need help with what I have experienced. Greetings, ggrdn1250, welcome to YGS and thanks for sharing these photos with us. I have no idea what is in the first photograph; there does seem to be a humanoid shape on the right. In the second photograph, though, there appears to be a lot of sunlight hitting the parked buggy. I suspect that the sunlight is reflecting off of the buggy into the camera lens; the convex lens inverts the light so the reflection appears to be upside-down when compared with the brightly-lit sections of the buggy. This would account for the peculiar diamond shaped head on the oddly-flattened and very short stature of the phenomenon. Thank you for including your photos! I am no expert on photo analysis but it sure looks to me as though you caught something in both. The first on the left with the time stamps looks like a fellow wearing cavalry boots with spurs. The right boot and spur are what I see the most clearly... Maybe there's a horse there too but we just can't see it. Otherwise, the reason why a pair of boots might be 'floating' under a tree run to the sinister... In the other I see a human figure that seems male to me judging from the width of the shoulders - the bulkiness there leads me to speculate that he is wearing a uniform. Something about the outline of his head lends itself to a flat cap or kepie. © The ghost story Game Cam Photos is copyrighted to ggrdn1250. Edited by yourghoststories.com.